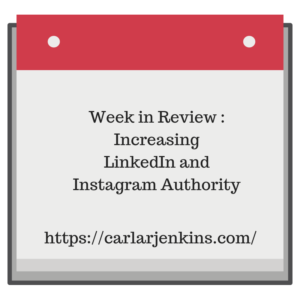 I am back in full force with growing both my LinkedIn and Instagram audiences. I have achieved some very big LinkedIn milestones. Crossing this LinkedIn threshold is major because I am a business blogger. LinkedIn is my playground. I love engagement with my community and learning from others. This is also my second 2000-follower social media. Pinterest is my first with 2265. I do see LinkedIn eclipsing Pinterest for these reasons: 1) PM.Expert is down which is a major driver for my project management board and 2) I am devoting more time towards LinkedIn. I have written my 300th LinkedIn Pulse article this week. It is a monumental accomplishment because not too many people even get to 100. There have been a whole lot of personal and professional changes happening in between my going from 250 to 300. I am already ready to write my way to 400 and see where this journey takes me. If you’ve been reading my blog, you’ve noticed that I have returned to Periscope and IG Live. Well, I am very committed towards increasing my livestream presence. I am testing out Loola.tv to stream on IG Live directly from my laptop. I love livestream and have been doing it since July 2015 on Periscope. This is why I love returning to Periscope. It is my first love. I am glad that people are watching mine after being off for over 1 year. It is great to be back on Periscope. Although I haven’t been on IG Live as much, I will broadcast on there at least 2 times a week. Yes, I am officially back and streaming from my computer via Loola.tv! I just love being hands-free when I stream plus a computer has a wider screen. I am going live at least 2 times a week discussing social media, personal branding and project management. I love IGTV because I love having a dedicated TV stream where I can educate, engage and have fun! I love sharing my experiences with people (I also love watching IGTV videos and channels! ).